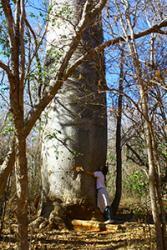 : Hugging a Cavanillesia umbellata, one of the most conspicuous elements in the dry forest. Mata Seca State Park, Minas Gerais, Brazil.The Latin American Seasonally Dry Tropical Forest Floristic Network (DRYFLOR), funded by a Leverhulme Trust International Network grant and including more than 50 scientists and conservationists from Latin American and the Caribbean and led from the Royal Botanic Garden Edinburgh, has developed an unprecedented database of dry forest tree species, based upon 1602 inventories across Latin America and the Caribbean. In this paper, featured on the cover of the current issue of the journal Science, the group show that these dry forests contain a remarkable 6958 species of woody plants. Their data demonstrate that the species found in different regions of dry forest are seldom shared, meaning that each contains species growing nowhere else. This conveys a simple but urgent message that numerous protected areas across many countries will be needed to protect the full diversity of dry forests. 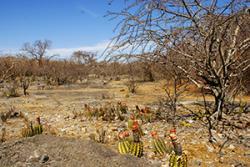 In the light of probable warmer climates in the tropics, conservation of unique dry forest species that have adaptations to heat and drought should be global priority. DRYFLOR’s results provide a scientific framework within which, for the first time, national decision makers can contextualise the significance of their dry forests at a regional and continental scale. Limestone outcrop showing the heterogeneity of the dry forest landscape. Mata Seca State Park, Brazil.Professor Morag McDonald, head of the School of Environment Natural Resources & Geography at Bangor University, and one of the paper’s contributors said “tropical dry forests have long been neglected in research and conservation terms in comparison with the more iconic rainforest. This work highlights just how important dry forests are for biodiversity, and given how fragmented they are in disturbed tropical landscapes, must push them to the forefront of the conservation effort”.